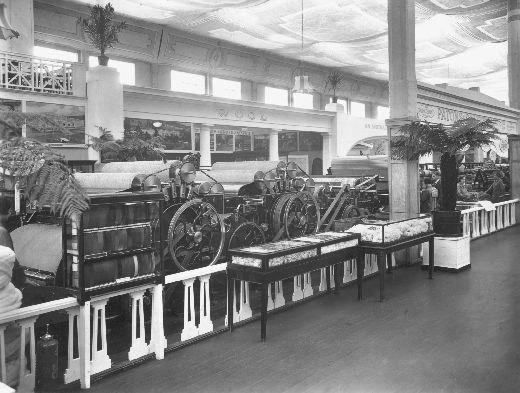 Photograph of the knitting yarn manufacturer Patons and Baldwins trade stand c. 1920. In the foreground are two cases containing raw wool samples and carding and winding machines. In the 1770s James Baldwin of Halifax and John Paton of Alloa (Scotland) founded two yarn spinning companies. During their early years both companies produced mainly hosiery yarn for machine knitters however in the mid-nineteenth century they diversified to make hand knitting yarns and patterns. In 1920 the two companies amalgamated to form Patons and Baldwins Limited with mills in Halifax and Wakefield (Thornes Mills and Rutland Mills).